Firefox is one of the most commonly used browsers and it has many interesting features. 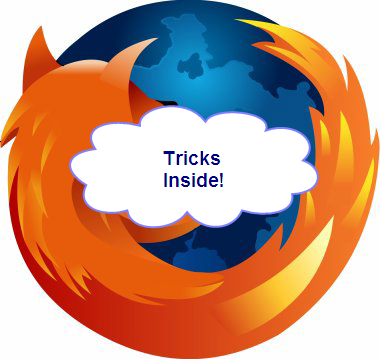 In this article I have given some funny Firefox tricks. This will not harm your computer and they are tested in the latest Firefox version. Just try it. Open your Firefox browser and copy paste the below codes one by one into the address bar and press enter. This will show you a dancing Firefox. Your Firefox window will automatically popup anywhere at screen. This will open another Firefox within in a new tab. So you will have Firefox within Firefox. This will open Firefox options dialog box in new tab. This will open your Firefox bookmark manager in new tab. This will open your history in new tab. This will open your extensions tab in your current window. This will open the “cookies window” inside a tab in the Firefox window. This will open the “Clear Private Data” window inside the current tab. This will open the “About Firefox” Dialog box inside the tab.